Rice flour is made by grinding rice into a fine or course powder by processing it in a mill. This essential ingredient has grown popular in today's generation not only due to its health benefits but also due to the fact that it is entirely gluten free, but it has been used in Indian cooking and its array of cuisines for decades, predominantly in the Western and Southern region. Depending on the kind of recipe one wants to make, the flour used can either be coarse or fine. Moreover, the rice flour can also be brown or white depending on the rice one uses. Everyone knows that rice flour is an essential part of almost all cuisines in India. Whether it is the Maharashtrian Amboli, which is a thick pancake made with rice flour and eaten with chutney or usal or its close friend South Indian Neer Dosa, eaten with coconut chutney or vegetable stew, rice flour produces really soft pancakes that taste brilliant. Even Gujaratis use it as a staple in simple recipes like Khichu, wherein the rice flour is cooked by adding it to boiling water, stirred continuously, flavoured with cumin seeds and green chillies and served with raw oil! The Bengalis also make a variation of rotis by switching the whole wheat flour for the rice flour and seasoning it with spices to make Chawal ki roti. Another innovative recipe that is made with this is Green Pea Panki, which is batter steamed between two banana leaves to get a really thin pancakes. There are endless possibilities of snacks that can be made with rice flour. Though most of them are fried, they are absolutely delicious and so crispy and flaky! One of the most famous snacks in India is Chakli, spiced rice flour bound with curd and deep fried to make a crispy snack which is mostly made in during Diwali. Ribbon sev is a similar snack where the dough is made with rice flour, besan and butter, shaped into thin strips and deep fried to perfection. Since rice flour provides a great texture and flakiness to snacks, it is used in making Verki Puri to give the perfect layers to it and in Bread pakodas, which is bread dipped in a mildly spiced batter and fried, to make them crisp. This flour is not only used in making fried or steamed snacks, it can be used in delicious breakfast dishes as well. You can make Stuffed Cauliflower Parathas that are crispy on the outside and soft on the inside, a variation on the classic uttapam like Green Peas Uttapam or this gluten free Palak Paneer Roti which brings you the classic flavors in the basic form of a roti. Using this flour in sweets is not something we think about usually but it has actually been a part of dessert making culture for a long time. The Chinese use it when they make their famous Fried bananas coated in a rice flour batter and just like that, even in India, when Ganesh Chaturthi starts, you will see a sudden overflow of Modaks to serve as a sweet treat to Lord Ganesha. Even though Golpapdi is usually made with only whole wheat flour, making it with jowar flour and rice flour gives a nice twist to the original, and just like that you have desserts made with Rice flour. 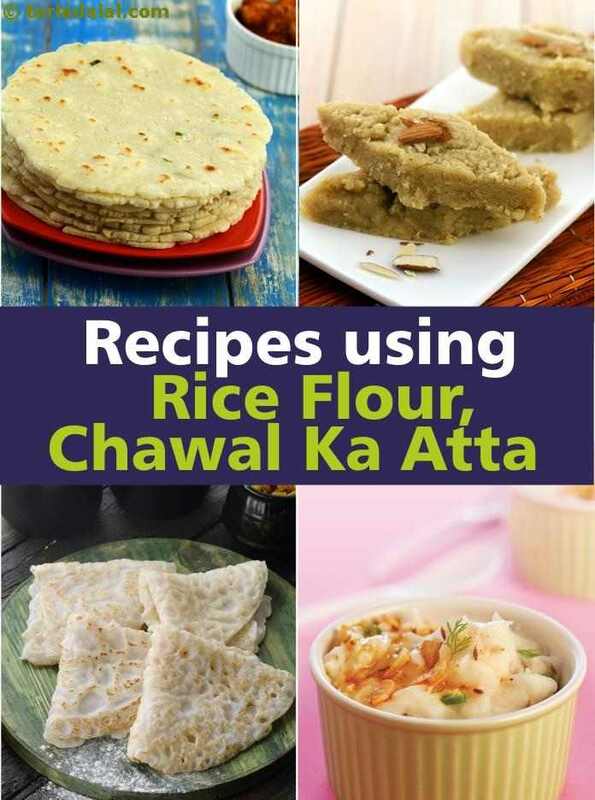 Enjoy our rice flour recipes collection below. This tempting south indian version of chakli is made using rice flour enhanced with sesame seeds and cumin seeds (optional). Keep the snack handy for between-meals hunger pangs! Suggested serving size for 100 calories: 1 dosa fibre, iron and calcium rich green peas and low-fat paneer stuffed in whole wheat dosas make a succulent snack - just make sure to stick to the suggested serving size.